As much as we try to avoid it, spills are practically inevitable. 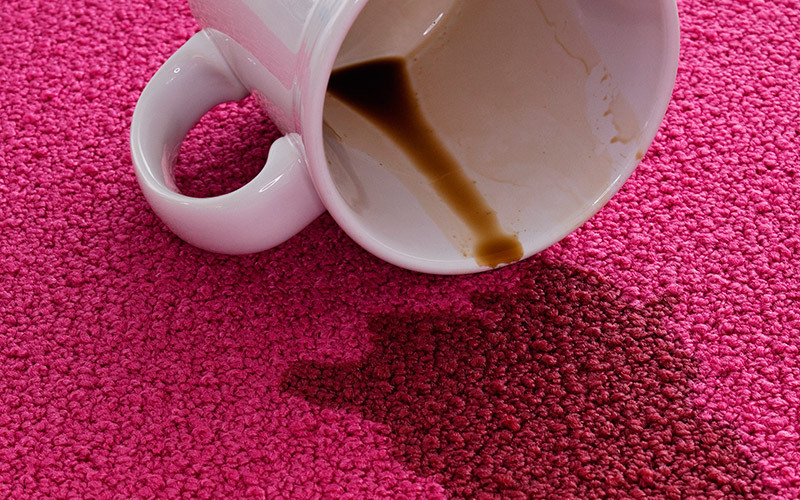 When spills happen on carpet, they can be difficult to remove - especially pet stains, red wine stains or blood stains. Indianapolis carpet store, Kermans, has a few key tips to handle even the toughest carpet stains. Today's carpet manufacturers often build stain and soil resistance directly into the carpet fiber. 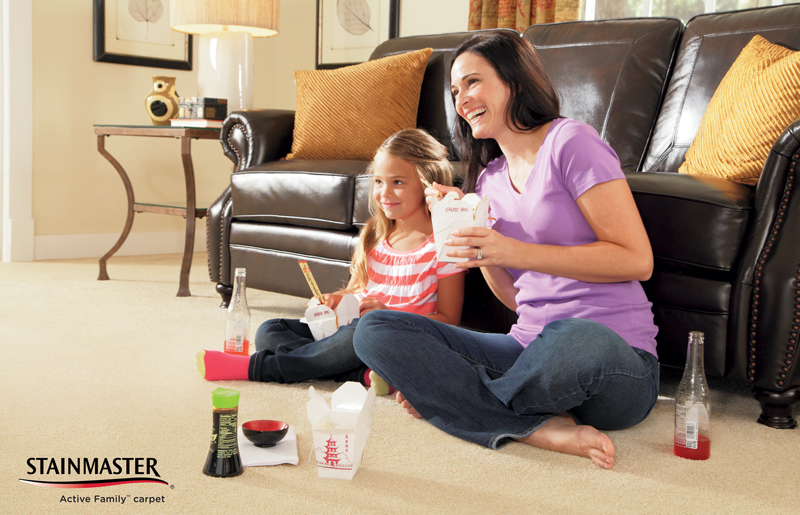 Spill protection and stain resistance make the carpet easier to clean and maintain. Long-term they also make the carpet more durable. If you're in the market for carpet, be sure to ask about the stain resistance of your choices. Kermans carries the nations best known carpet manufacturers and offers a wide range of stain resistant carpet. Stain resistant or not, if you get one of these spills on your carpet you'll want to act quickly to keep it from doing lasting damage. You'll see a few things in common with all of these tips. First, act quickly - the faster you get to a spill, the better chance you have of stopping it from soaking in. Second, blot don't rub. Rubbing a spill may seem like the fastest way to soak it up but you could be causing permanent damage to the carpet fibers and pushing the spill into the carpet padding. Blot to soak up the spill, your carpet will thank you. Before trying any of these stain removal tips, check with your carpet warranty. Some manufacturers place limits on what you can use on your carpet and if you don't follow them, you'll void the warranty. In a spray bottle, mix together 1/4 cup of white vinegar, 1 tablespoon of dish soap, and fill with water. Spray the area with this vinegar solution, let it set for 5 minutes and then blot with a clean towel until the stain is removed. Use a clean rag to dab away the stain with water. If the stain proves stubborn, mix one tablespoon white vinegar and one tablespoon dish soap with two cups of warm water. Dab the stain with that solution and blot with a clean towel. For a fresh accident, clean up the initial mess and debris and blot the remaining stain with a clean towel being careful not to rub or smear the mess. If the stain is stubborn, use a carpet cleaning product specifically formulated for pets. For a stain that has dried on the carpet, moisten it and then apply the pet-specific cleaning product. Have pets? Here are good carpet recommendations for your home. Always use cold water instead of warm or hot. The cold will prevent the blood from soaking into the carpet fibers. Fill a spray bottle with cold water and two teaspoons of liquid soap (grease-fighting soap works best). Moisten the stain with the solution until it is soaked. Use a clean towel to blot the stain until the blood is gone. Rinse with cold water and repeat as needed. When you encounter a tough stain on your carpet, be persistent but gentle. Keep our free carpet cleaning guide on hand to help with every day cleaning. Taking care of your carpet helps you keep it looking like new for years to come.